Picture a beautiful blue ocean. Trade winds are blowing and you're at the helm of the most fantastic yacht you've ever sailed. It's a 58ft Tayana, your reward to yourself and your family for a lifetime of reaching goals one step at a time. Now it's time to take the big step and reach out over the ocean to explore remote archipelagos and discover your own tropical paradise. Own a Tayana 58 and you'll enjoy new levels of confidence in your yacht's strength and all weather performance while making passages a pleasure for everyone on board, from the serious sailor to the holiday guest alike. 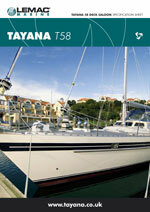 We have just received our first Tayana 58. It is the only model of its kind in Europe. To book your tayana experience please click here and get in touch. Two black iron fuel tanks with baffles, 150 gal total capacity. Three (3) halyards, main, genoa, staysail and spinnaker, led internally.